Turkey Pizza Burgers- Quick, delicious & simple! 1. Heat gas grill to medium-high or prepare charcoal grill with medium-hot coals and set up one side for indirect grilling. Lightly coat grill rack with oil or nonstick cooking spray. 2. In a large bowl, mix together turkey, 3 tablespoons of the marinara sauce, Italian seasoning, garlic salt and onion salt. Form into 6 equal patties. Grill for 4 minutes per side or until internal temperature registers 160 degrees F on an instant-read thermometer. 3. Turn off grill. 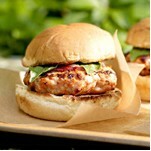 Top each burger with 1 tablespoon marinara sauce, 1 tablespoon of cheese and 2 basil leaves. Close grill and wait 5 minutes until cheese melts. If using charcoal, place burgers over indirect heat. Serve on buns. For a Mexican option, omit marinara, mozzarella, basil and seasoning. Mix 2 chopped chipotle chilies in adobo into meat. Top burgers with pepper Jack and salsa.